Working in cold, dry or wet conditions often lowers your productivity. 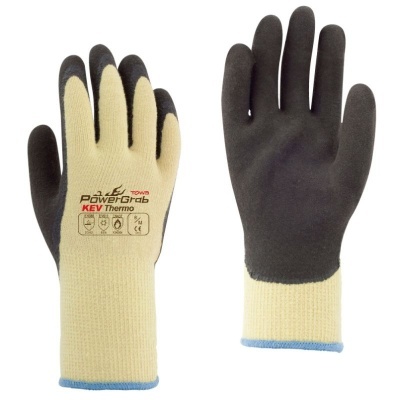 The Towa PowerGrab KEV Thermo Kevlar Latex Coated Grip 345 Gloves are designed with a double latex coating to protect your hands against liquids, allowing you to stay warm and comfortable for prolonged tasks. Using MicroFinish technology, the gloves also improve your grip in wet and dry conditions. This allows you to work efficiently without having to worry about dropping objects you're handling. These are designated Category II gloves, meaning they should be suitable for most medium-weight tasks. The gloves offer excellent protection against cold temperatures and liquids. This makes them particularly suited to handling tasks in cold weather where there are liquids involved. Watch the short video below to find out how the MicroFinish technology used in these gloves could help you! This helps improve your grip in most conditions. The KEV Thermo Kevlar Gloves are available in five sizes to fit most hands. Please measure the circumference of your hand around the knuckles (excluding your thumb) with your palm open and your fingers together. Next, measure the length of your hand from the tip of your middle finger to your wrist.